Earlier in the week I made a trip to Wichita by way of the turnpike. I drove through the toll gate and entered the access ramp. As I was about to merge into the traffic, I saw a bright orange sign with a warning: Right Lane Closed Ahead. 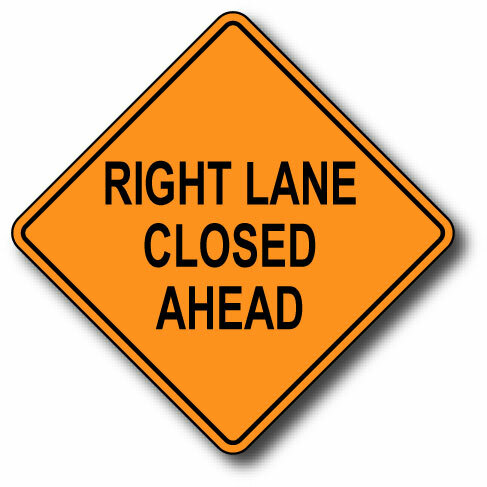 As I contemplated the message of the sign, my warped mind thought: If the right lane is closed, does this mean I have to drive in the wrong lane? Since the left lane was the only lane left, I made the decision to take it. Sometimes we have very few options when we have to make a decision. To make some choices, all that is needed is the flip of a coin and either heads or tails decides a course of action. Each and every day of our life, decisions need to be made. Robert Frost wrote of this when he penned The Road Not Taken. Some will choose to try the comfortable well-travelled path of the known, and others will choose the more adventurous paths of life. Sadly, the well-travelled path is frequented by the masses and can lead to the wrong destination. Perhaps we need to be a little more adventurous and take the road less travelled. We need to hike the trail that Martin Luther King Jr. spoke of when he said: Darkness cannot drive out darkness: only light can do that. Hate cannot drive out hate: only love can do that. I’ll close with this thought: There are two ways a person can spread the light; He can either be the candle or the mirror that reflects it.